The color perfectly matches the blue in my rug. It's well made and washes beautifully. Handcrafted solid quilt with intricate stitch pattern. Great as a stand alone quilt or for layering with a printed design. 100-percent cotton, machine washable, pre-washed, and luxury oversized. Very high quality, wonderful ample size, soft COTTON material, and lovely quilting. I love this brand of cotton quilt. It is the only brand I will purchase. I returned this quilt only because the shade of blue did not match the rest of my masterbedroom. This shade of 'colonial blue' is a nice blue/gray which I needed to go with a new rug. The design is nicely woven in. The only shock was that the matching shams were $*each - I thought I was getting two and had to re-order another once they came. Great, true quilt. Nice fabric, impressive quality and nice stitch patterning. Medium weight for perfect layer or coverlet. Washes very well. I've bought this item in several colors, multiple orders. Its a wonderful basic. I wish they put all the colors together in one listing and had MORE colors available. It's really good. Excellent machine quilting. Dense machine quilting. Light weight for summer use. Good size. Color matches picture on web quite well. Would purchase again. I was looking for a well constructed and simple quilt. This item met those two requirements with high marks! The size is perfect for my queen-size bed. The stitching is very good and the feel of the quilt is substantial. I have not laundered it yet, but feel that it will suit my needs for some time! Nice job, Overstock. Great summer weight quilt. Nice muted color. This quilt is exactly what I wanted it to be. The color is perfect and so is the weight! Although this quilt needs to be washed to fit, the color is right-on and it washes easily. For the price it is an excellent choice. Great quality. Beautiful quilt. So happy with this purchase!!! Found this replacement for one I purchased in Williamsburg, Virginia about 18 years ago. Needs to be dry-cleaned-so beware. Very nice quality--fabric has great feel to the touch. I love the blue color exactly the color I was looking far. I also purchased the Stamms which are excellent both worse very very well come out looking brand new. Love the color and quality of this quilt. Only problem I had is that my new mattress is deep, reordered the king and that had worked well. 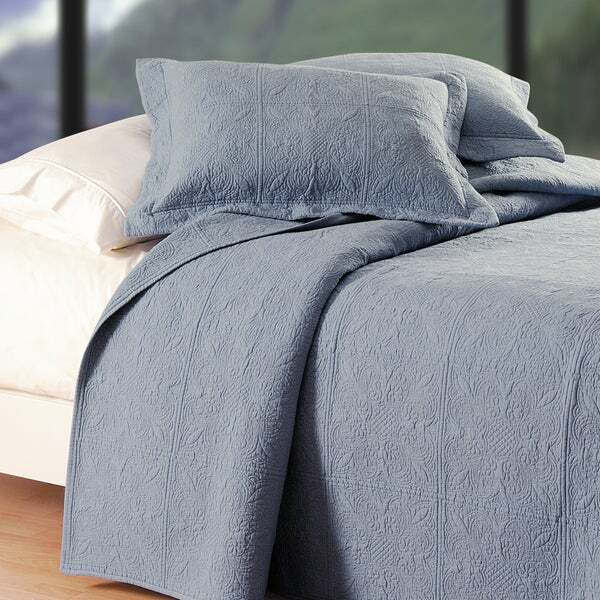 I use this Matelasse Quilt, as a blanket and bed cover; soft texture and cozy when needed! Best Quality! Feels more like a bedspread than a quilt. The king size is not big enough for the bed. Unlike the picture, the overhang does not cover the entire mattress. I love the simple style and beautiful color. Also like that it’s all cotton! "I'm looking under the Options tab(s) for the matching shams. No sign of them. If there are two colonial blue shams available, I would like to buy the quilt and the shams. Tell me where to find them, please." "can you by matching shams"
Hello! You can purchase the shams separately, they are currently out of stock and due to arrive the beginning of October. Have a great day! "Does the Colonial Blue Matelasse quilt come with shams?" Hello Daisy, no, the shams are sold separately. You can find them under the options tab. Have a great day! "how thick is this quilt? does it have a heavy feel to it?" Hello Michael C., we can appreciate the fact you want a firsthand account of the product. You will receive an email notification every time you get a response. Thank you for shopping with us. Is this quilt oversized for a king bed? would like measurements please.